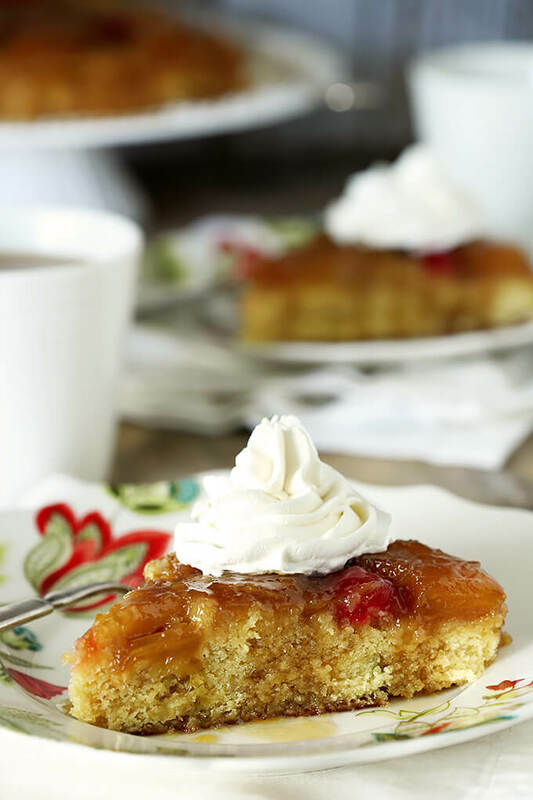 I don’t care if it’s considered old-fashioned, it’s still a favorite and for me, the Best Pineapple Upside Down Cake with Rum is a marriage made in dessert heaven combining those two tropical favorites into one beautiful cake. So I hear Pineapple Upside Down Cake is out of fashion; not popular, relegated to the annals of history as something from ‘back in the day.’ Well, guess I’m out of fashion because it’s one of my favorites. I haven’t had one in a very long time though but circumstances beyond my control made this meant to be. 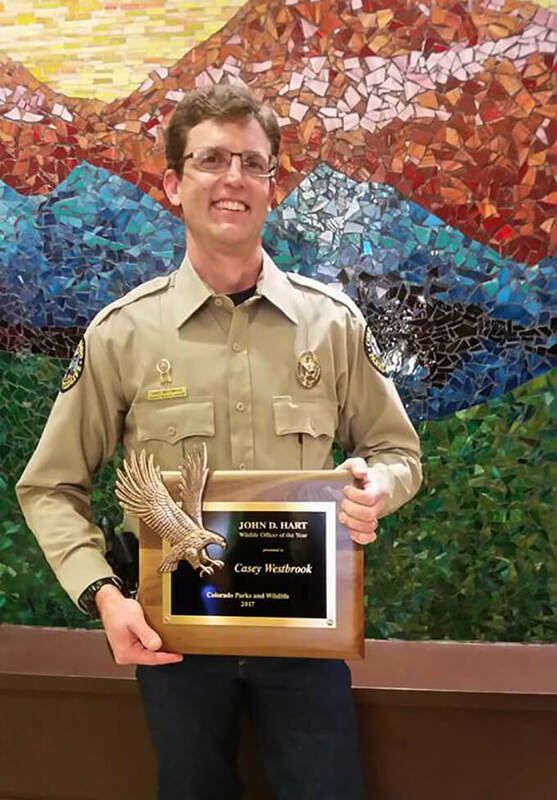 My neighbor Casey who lives across the street had just been awarded an honor from Colorado Parks and Wildlife as their ‘Wildlife Officer of the Year.’ I know he is mine; I like to kid but it’s true…I know more about the rules and regulations of hunting than any person who has never hunted and it’s all because of him. He’s shared a few tales and because of him I’ve seen a live racoon, a dead badger, a video of his family helping to release rescued bear cubs back into the wild, a herd of elk my eyes would have never spotted, and a real mounted deer with an automated head to help catch the bad guys hunting in all the wrong places! I wanted to have a little celebration and have some neighbors over so I asked him what he would like me to make. 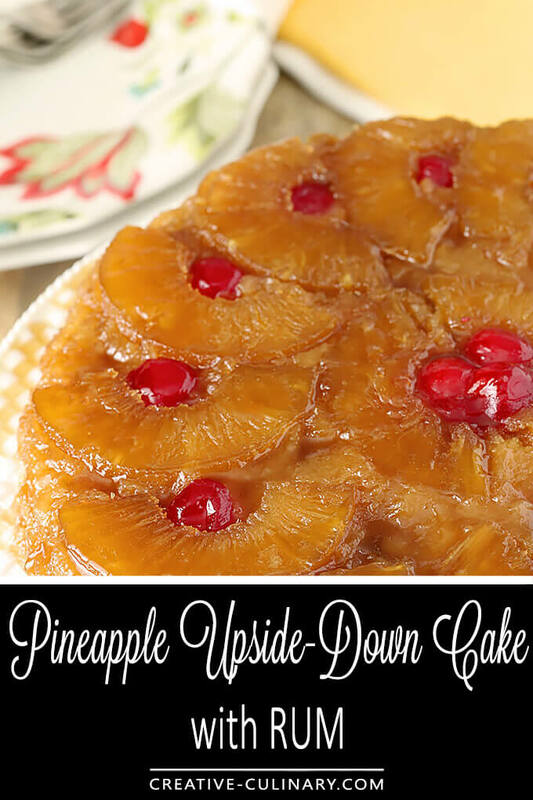 Of all things…Pineapple Upside Down Cake? Sure, I can do that! This post was old and so were the images so it was perfect; I got to update the photos of a dessert I love and we all had cake to share. Not lying, Casey said it was the best Pineapple Upside Down Cake he had ever had…and here’s some reasons why. The eggs are separated and the whites are whipped a bit; makes it lighter and a good balance to that richer than rich topping. The Rum. Honestly there is a bit of rum in the cake but it’s the rum in the buttery, gooey sauce on top that is really so perfect. I use fresh pineapple. Trust me, it is so worth it. It was a bit of a trial to get it right but use it if you can; if not it will still be a delicious cake! Upside down cakes have been made for centuries in this country using cast iron skillets that were placed over a fire; the practice of putting fruit and sugar in the bottom made for a simple preparation with the topping cooking at the same time as the cake. 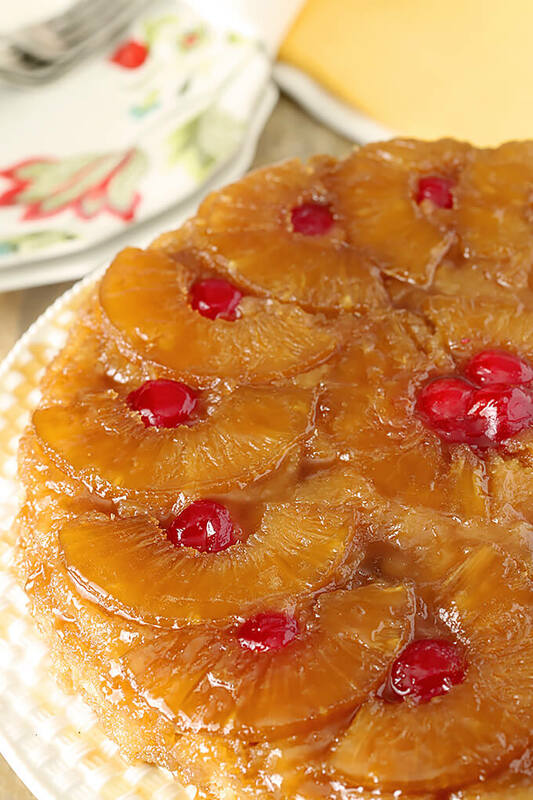 Pineapple became a popular fruit for decorating these skillet cakes in the early 1900’s after James Dole’s engineer invented a machine to both core and cut pineapples into rings…the addition of maraschino cherries was to simply add a boost of color. 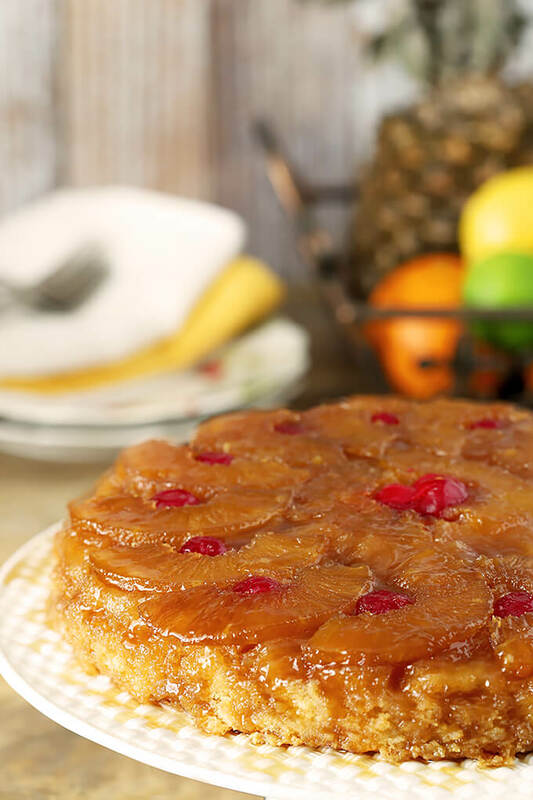 The first mention of this cake was in 1925 in a Gold Medal Flour ad that featured a full page photo of Pineapple Upside Down Cake and described it as we still know it today; a round cake with slices of pineapple, candied red cherries and a brown sugar/butter glaze. Researchers have discovered several references through the next decade, most notably the 1936 Sears and Roebuck catalog. I’ve been making this cake for as long as I can remember and I won’t deny that for most of those years it included canned pineapple and a boxed cake mix; those conveniences are certainly what helped the cake gain notoriety during the 1960’s and 1970’s when women were leaving some of their traditional roles and demanding more ease in the kitchen. Fast forward to today when many of us prefer to circumvent that ease and enjoy doing things ‘from scratch.’ From my experience, the extra effort is so worth it. Even peeling that pineapple was easy. I wasn’t concerned about the peeling which is really pretty easy; cut off the top and bottom and slice the outer skin off by starting at the top and and slicing downwards following the curve of the fruit. My challenge was to figure out how I would remove the core without making a mess that would ruin the whole look. To the rescue? My Grandma’s biscuit cutter! It has a piece that is removable that makes a center hole so it can also be used for donuts so I removed that little piece and used it to core each slice…yes, I was pretty doggone pleased with the results! Now I have to say I was OK with this method until my neighbor Sam suggested I try a gadget he had for peeling and slicing the pineapple. I sort of like my quirky fix but the truth is that not everyone is going to have Grandma’s biscuit cutter so I thought it might be wise to take a peek. 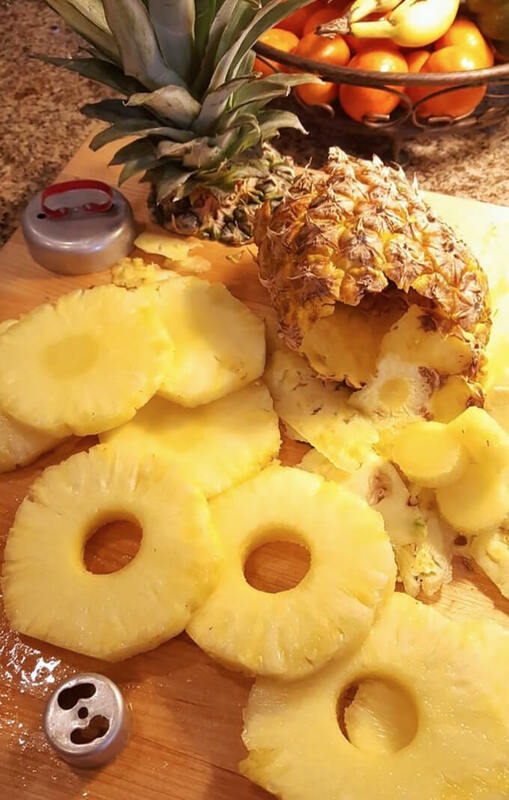 Doggone it…this Pineapple Peeler/Corer was quick, easy, and made nice neat circles, something I certainly wasn’t getting and removed the core all at the same time! I succumbed and was happy I did and Sam even said I could keep my new favorite gadget (he just wants more cake!). This recipe is so old, the card it was written on when I first decided to write it up was barely legible; I think it may have been my Grandmother Vaden’s writing, copying a recipe for me from one of her many cookbooks. I most often remember baking and cooking with my Grandma Bathe, my Dad’s mom, but it was true then and I’m reminded of this fact today; my Grandma Bathe was the ‘pie’ Grandma and Grandmother Vaden was the ‘cake’ Grandma. So if this was handed down from a Grandma of mine…well, Luda Vaden it must have been! Am I am so single minded in my thinking that I no longer offer any surprises? I guess we are all creatures of some type of habit right? So; any surprise that I added rum to this cake? I mean really, how could I not? Pineapple. Brown Sugar. Butter. Don’t those just CRY out for Rum? I thought so too! I’ve updated this time honored recipe to include some dark rum…oh baby was that a good idea! Almost a hundred years of history; my own family history of half that time; pineapples from Hawaii (thank you for joining the Union and sending us pineapple), those bright maraschino cherries…what about all that is NOT American? I hope you will dust off any notion that this is old or old fashioned. I prefer timeless or vintage; it is most definitely a cake that should not be forgotten. Come over and have a slice; you’ll see what I mean. The post The Best Pineapple Upside Down Cake with Rum appeared first on Creative Culinary.